Directions: From Denver, take I-70 to Hwy 58 West. Turn left (south) on Hwy 6 and right (west) onto Lookout Mountain Road. 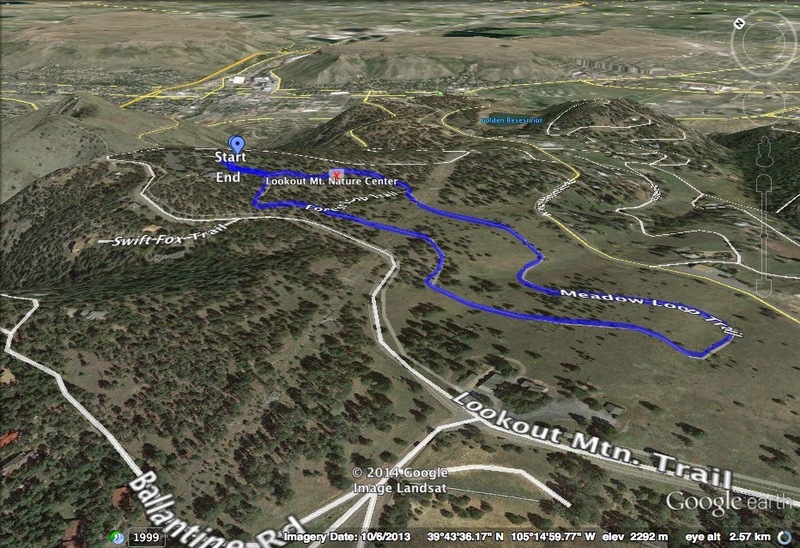 Take Lookout Mountain Road all the way to the summit (watch for bikes). Make a right on Colorow Road and a left into the Lookout Mountain Nature Center Parking Area. The trail starts behind the Nature Center. The Lookout Mountain Nature Center is a wonderful resource. The nature center itself provides exhibits, classes, nature walks, lectures, and programs. Located at the top of Lookout Mountain within the Windy Saddle Open Space Park just west of Golden, and next to the Boetcher Mansion, it is a worthy destination for kids and adults alike. There are also two nature trails within the confines of the Nature Preserve. The Forest Trail is a short hike along well maintained dirt trails that meanders through the pine forest and has interpretive signs along the way. The Meadow Trail is a little longer and rolls across the high meadow and through strands of spruce and aspen trees. Both loops together are about 1.2 miles. This is a terrific trail for young kids or anyone who wants an easy relaxing hike with and educational component.